People often wonder what it would be like to walk a mile in another person’s shoes – and this year’s Forres Culture Day offered just that chance. 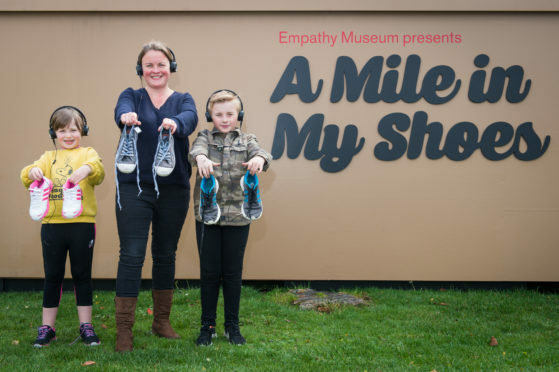 Young people from throughout Moray supplied a pair of shoes and a story to an interactive exhibit created by Empathy Museum and the National Theatre of Scotland (NTS). A giant shoebox was erected in the town from where a shop assistant handed our footwear and a headset with one of a diverse range of stories built-in. Participants could be seen wandering the town throughout Saturday, taking in the sights while learning about those whose shoes they wore. Jo Walsh, a producer at NTS, said the audio experiences told particular stories – not life stories – to offer a small insight into the shoe owners’ lives. “There are a wide variety of stories,” she said as the event got underway. “One is about a young man – he’s now about 20 – whose pair of crocs saved him from being electrocuted when he was much younger. “We’ve got his crocs here and he tells his story. “Then there are others talking about hobbies, their family relationships or discussing mental health issues that they have. Culture Day in Forres was run as part of the 3rd Findhorn Bay Festival and saw hundreds of people flock to the town to take part. Tolbooth Street was closed to traffic throughout Saturday and transformed into a carnival-like showcase of the region’s art, craft and music scenes. One of the most striking elements of the day was a Pictish-influenced musical march up and down the street, with the energised crowd dancing along to the infectious beat of their drums. A man dressed as a giant tree also took part in the festivities, to the enjoyment of the local children.